NILES — Stephen Simunich slipped out of his shoes and stepped up to the scales. 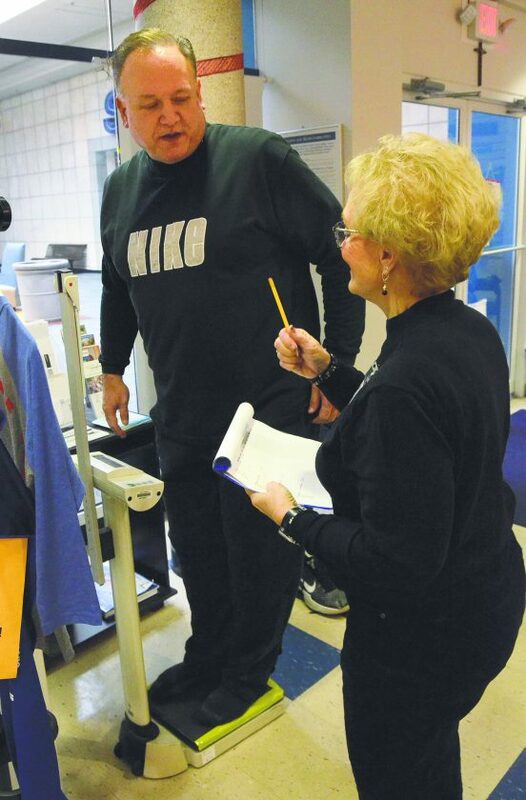 “Take everything out of your pockets,” said St. Joe’s at the Mall Manager Shirley Lisk. She stood with pencil poised over the 2019 Tribune Chronicle / Mercy Health Fitness Challenge log book. There would be no artificial inflating of starting weights under her watch. Light or not, it went. Only then was he permitted to stand on the scales. And the 18th annual Fitness Challenge community weight loss competition to benefit charity had begun. Thursday was weigh-in day for the 120 people representing 24 five-member Fitness Challenge teams. The teams that lose the greatest shares of their starting weights over the next eight weeks will gain the largest portions of the prize money to donate to nonprofit service organizations of their choice. The idea is to kick-start healthier eating and exercise habits for the new year with encouragement from friendly competition. In preliminary calculations, the 24 teams weighed in Thursday at a combined weight of 27,213.5 pounds. That averages out to 226.8 pounds per player. The lightest beginning weight this year belongs to God’s Busy Bees, whose five players tickled the scales at a total 848.25 pounds. That works out to less than 170 pounds per person. At the other end of the line, the Faithful Five lumbered in a combined 1,376.75 pounds to earn the dubious distinction of heaviest starting weight. That’s a tad more than 275 pounds per person. This year, the Fitness Challenge is divided into two divisions, the Dynamos and the Go-Getters. The Dynamos division was created so that the heavy-hitters can have a league of their own. If at least three members of a team played on a team that finished in the top five in any of the last five years, they must compete as Dynamos. This gives the newbies and normal people a chance to win top money as well, in the less-intensive Go-Getters division. Each team pays a $250 entry fee. Each team will give at least $225 of that money to the nonprofit service organization of its choice. The top five teams in each division earn more. First place, $775; second, $575; third, $400; fourth, $325; fifth, $300; sixth and lower, $225. For dessert, the team with best single-week performance each week earns a bonus $10, with puts another $80 in play for both divisions. A few of the players are newcomers. Most have been in the Challenge before and return for two major reasons: to shrink even more than they did the year before; or because they put it all back on over the last 10 months and need to start over. Simunich, of the Because We Can team, is a little of both. “I did it for a couple of years but last year, I dropped out. I don’t know why,” Simunich said. His plan: Light, 25-minute workouts six nights a week, and build intensity as the weeks continue; and oatmeal for breakfast, fruits and vegetables during the day, and one full meal in the evening; and no wine and cheese during Sunday night card games. Newbie Kathleen Ferris, a Zumba and aerobics junkie who turns 73 this year, figured if she was ever going to join the Challenge, she better hop to it. “My husband says, ‘You’re not getting any younger. This is your last chance to lose weight,'” Ferris said with a laugh. She appears to be fit, spry and slim already. “But I’m solid,” she said. Ferris said she dropped 30 pounds six years ago in a Mercy Health nutrition class, but it’s finally all come back. “I’m going to have to kick it up,” she said. “I’m going to have to walk. I’m going to have to be methodical. I’m going on 400 calories a meal, and I’m going to be chart-y (and log everything). “This is our year, I can feel it in my bones,” Jennifer Kos said. Kos, a psychologist at PsyCare Howland Clinic and a member of longtime competitors the PsyCare Hungry Gamers in the Go-Getters division. “Last year was fantastic for me,” she said. “I had gained a lot of weight by stress eating. I was the heaviest I had ever been except for pregnancy. I lost 21 pounds and kept 18 of it off. “My goal is another 15 pounds this year. That will reach my goal weight. Then I won’t be back next year,” Kos said. The Fitness Challenge has been an interesting study, she said. During the competition, team members kept each other encouraged and on track as they took on the other teams. What brings him back to the Challenge this year? “Good living and an Italian cook who is very good at it,” he said. As long as they’re back in, they might as well win it all this year, he said. Still, they always finish in the money and have earned their spot in the Dynamo division. “We’re not in that sissy group,” he said. And there’s the first smacking of the lips talk of this year’s Fitness Challenge. This week, Kathleen Ferris shares the story of how her team came up with their name — LOSTinspanx. They know a good Fitness Challenge team name when they hear it. That was it. Spanx Inc. is an American underwear maker famous for shaping briefs and leggings intended to make wearers appear thinner. The name, with a few tweaks to punctuation, seemed, uh, fitting. “We’re Master Gardeners — we’re crazy anyway,” Ferris said.